We in the international development community talk a lot about privacy and security in digital development. We try to think through privacy and security in terms of the data we collect, what we do with it, and even how we address issues of consent around data collection. There’s an entire digital principle about it. In discussions like these, privacy and security are framed entirely in terms of the paradigm of extraction—collecting and gathering data from end users to organizations. This is an entirely valid and important discussion to continue having. However, there’s a discussion we’re not having that’s arguably even more important, and that’s around the privacy and security of users. What do we mean by that? Rather than only having a discussion around what the international development community should be doing to protect and secure the data we collect about the people we work with, we need to think about whether the people we’re collecting this data from are fully aware of the choice they are making when they engage in the digital ecosystem and share their personal data—with us, or a social media platform, or in any digital interactions. It’s really not just a question about consent, rather it’s a question about whether our work enables and empowers people to make well-informed decisions about their digital footprint well beyond a digital development initiative. You’re probably now thinking to yourself, sure…but HOW do we do this? First off, we address whether we add value rather than just how we address privacy and security for the data we collect. Don’t get us wrong, we know the community’s intention has always been to add value to the contexts within which we work, but what we’re advocating for is taking this one step further and articulating it clearly as an additional Digital Principle. A Digital Principle that looks beyond the development or design of development programming that leverages digital tools, and looks at the ever-changing global digital ecosystem and determine the best way to support people to participate in the digital economy while protecting their privacy and securing their information. For us, the answer is education. Through our digital development programming we touch millions of lives and support communities to adopt digital tools that allow them to access medical assistance, engage with financial systems, and gain information about treating agricultural pests. By employing human-centered design, we create digital tools that take into account the access and usage realities of the people living in the communities we target. Because of investments in user research, we know that social media is a significant and growing part of the digital experience of mobile and internet users in the developing world. Thus, rather than create duplicative tools and repetitive technologies, digital development practitioners often use Facebook, WhatsApp, Telegram, and other platforms in our initiatives. Good design says meet the user where they are, and in many markets, it’s on these platforms. These are practices we should continue to follow. In addition to meeting users where they are and teaching people how to use and employ the digital tools we create, we should also commit to educating users on digital literacy and digital resilience more broadly, especially given the prominent role social media plays and how vulnerable these platforms are to malfeasance. That way, users will not only know how to leverage the sustainable digital tools developed during a specific initiative, but will also be aware of what it means to share data online, how to critically engage with information shared digitally, how to safeguard digital accounts, and how to protect their privacy online. In the end, this additional education component will mean that as people gain greater access to the digital ecosystem, their participation will be responsible, both as an individual user and as part of the community of users globally. If anything, more mature digital ecosystems could benefit from a similar approach. 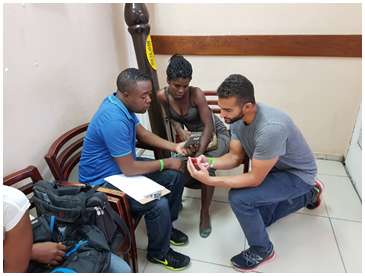 Karim Bin-Humam during Frontier Insights in Haiti, teaching people how to use mobile money applications. So, who is responsible for implementing these digital education initiatives? If we look at history as our a guide, it would suggest that the government is responsible. Take the case of the United States during the transition from a predominately agriculture-based economy to a predominantly industry-based economy. During that time, the skills needed to succeed changed and the U.S. government enacted a set of public policies that led to the creation of the public school system which sought to teach every child the basic skills of reading, math, and writing. In other words, the skills needed to succeed in the new economy. Today we have a new set of basic skills required to succeed in an increasingly digitized world. In addition to basic math, reading, and writing, people also need to have a basic set of digital skills allowing them to participate in the digital ecosystem. Should government be responsible for ensuring people learn this new skill as it was in previous times? Probably not. The digital revolution has reshaped the way governments serve their populations, the way businesses reach customers, and the way people interact with each other. Therefore, government is no longer the only actor with the best access to the majority of the population. The private sector, donors, civil society organizations, and development implementers also interface with people daily, providing access to information, goods, and services. So whose responsibility is it? To be honest, we don’t have an answer, and doubt there even is one single actor that should be charged with this hugely important task. The answer may well be highly context-dependent and different in each country, which is why adding this as a tenth principle makes sense. We also hope that this blog and future discussions help kickstart a critical conversation around educating the user.